The numerical simulation of submarine maneuvering is a challenging problem that has only recently been addressed by advances in Computational Fluid Dynamics (CFD) software. 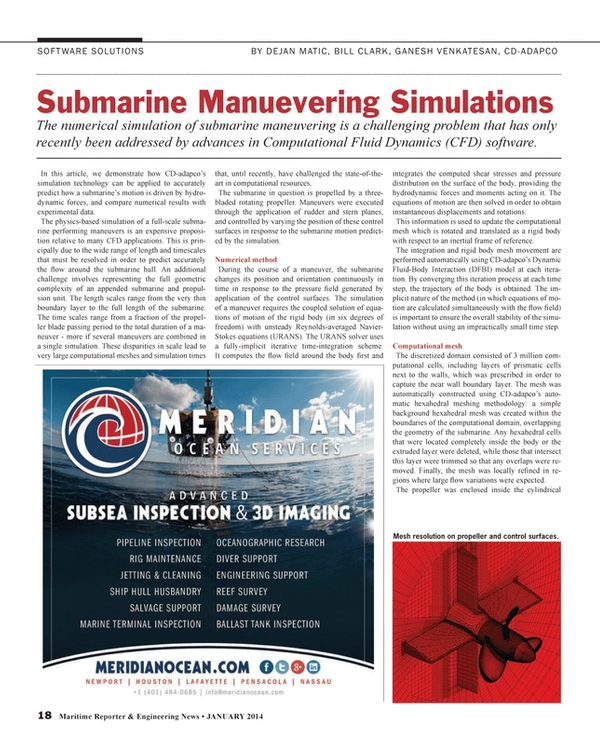 In this article, we demonstrate how CD-adapco’s simulation technology can be applied to accurately predict how a submarine’s motion is driven by hydrodynamic forces, and compare numerical results with experimental data. The physics-based simulation of a full-scale submarine performing maneuvers is an expensive proposition relative to many CFD applications. This is principally due to the wide range of length and timescales that must be resolved in order to predict accurately the flow around the submarine hull. An additional challenge involves representing the full geometric complexity of an appended submarine and propulsion unit. The length scales range from the very thin boundary layer to the full length of the submarine. The time scales range from a fraction of the propeller blade passing period to the total duration of a maneuver - more if several maneuvers are combined in a single simulation. These disparities in scale lead to very large computational meshes and simulation times that, until recently, have challenged the state-of-the-art in computational resources. The submarine in question is propelled by a three-bladed rotating propeller. Maneuvers were executed through the application of rudder and stern planes, and controlled by varying the position of these control surfaces in response to the submarine motion predicted by the simulation. During the course of a maneuver, the submarine changes its position and orientation continuously in time in response to the pressure field generated by application of the control surfaces. The simulation of a maneuver requires the coupled solution of equations of motion of the rigid body (in six degrees of freedom) with unsteady Reynolds-averaged Navier-Stokes equations (URANS). The URANS solver uses a fully-implicit iterative time-integration scheme. It computes the flow field around the body first and integrates the computed shear stresses and pressure distribution on the surface of the body, providing the hydrodynamic forces and moments acting on it. The equations of motion are then solved in order to obtain instantaneous displacements and rotations. This information is used to update the computational mesh which is rotated and translated as a rigid body with respect to an inertial frame of reference. The integration and rigid body mesh movement are performed automatically using CD-adapco’s Dynamic Fluid-Body Interaction (DFBI) model at each iteration. By converging this iteration process at each time step, the trajectory of the body is obtained. The implicit nature of the method (in which equations of motion are calculated simultaneously with the flow field) is important to ensure the overall stability of the simulation without using an impractically small time step. The discretized domain consisted of 3 million computational cells, including layers of prismatic cells next to the walls, which was prescribed in order to capture the near wall boundary layer. The mesh was automatically constructed using CD-adapco’s automatic hexahedral meshing methodology: a simple background hexahedral mesh was created within the boundaries of the computational domain, overlapping the geometry of the submarine. Any hexahedral cells that were located completely inside the body or the extruded layer were deleted, while those that intersect this layer were trimmed so that any overlaps were removed. Finally, the mesh was locally refined in regions where large flow variations were expected. The propeller was enclosed inside the cylindrical mesh block that rotates about the propeller axis, with a sliding interface between the cylindrical mesh block and the surrounding fluid domain. Rudder control surface motions were accounted for by using mesh distortion. As the rudder is deflected to a new position at each time step, the mesh in this structured block is locally deformed and smoothed. By employing this procedure only a single computational mesh had to be generated for the entire simulation - rather than creating several meshes for various rudder positions and interpolating between them. Because the rudder mesh motion was integrated into the solution process, less user input was required. For the case of constant heading and large depth, the submarine is assumed to be traveling through an infinite domain of stagnant water. The motion of the submarine is controlled by a three-bladed propeller, rudder and stern planes. The entire computational mesh including the submarine body is assumed to be moving with the body without any deformation. The flow field computations were performed in the inertial frame of reference, which makes the specification of boundary conditions easier. Since the body moves through infinite volume of stagnant water, the velocity specified at the far field boundaries of the computational domain is zero. For the case of horizontal overshoot maneuvering, the top and bottom rudder surfaces were actuated to initiate the maneuver. In the experiment, the rudder was first deflected to 10 degrees and held in this position until the body reached a yaw angle of 30 degrees. The rudder was then reversed. Figure 2 shows predicted pressure distribution on walls and streamlines behind propeller. Predicted time history of roll, pitch and yaw angles show good qualitative agreement with measurements, see Figures 3 and 4. Good qualitative agreement has been shown between predictions and measurements for the studied maneuvers. The results obtained demonstrate the suitability of the present methodology for the simulation of submarine maneuvers and motion of similar underwater autonomous vehicles. CFD simulation tools will help engineers to optimize the design and analysis process and improve the maneuvering capabilities, survivability and cost of submarines.